These days, it seems like everyone’s going retro, but why buy cheap imitations of cool vintage stuff when there’s a great selection of the real thing online? 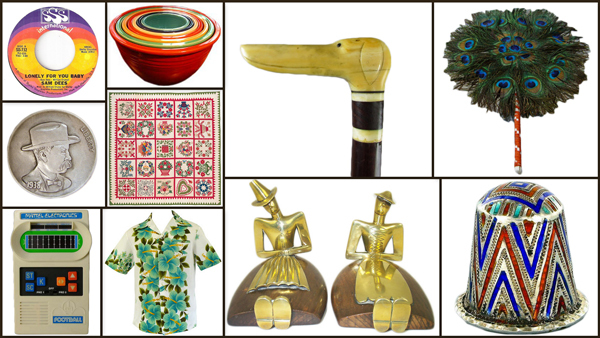 Treat Dad to a set of vintage clay poker chips or high-quality gutta-percha golf balls. Maybe Mom would like turquoise jewelry or a snappy tweed blazer. For that friend who loves “Mad Men,” how about a mid-century-modern atomic clock? Your gift will stand out from the crowd, and you’ll be giving your friends and loved ones what they really want. 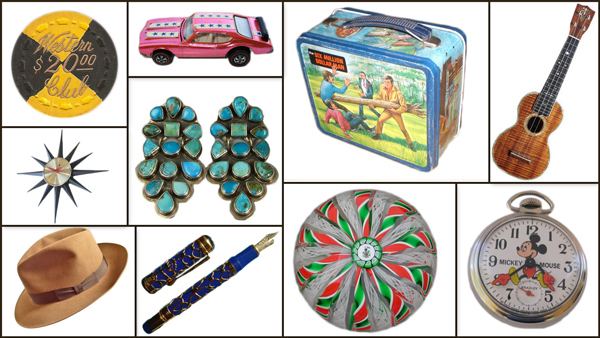 Here then are our Top 40 Vintage Gifts. Happy holidays! 1. Poker Chips Made of clay composite, casino chips embossed or incused with elaborate patterns add a touch of Rat Pack class to any home card game. 2. Hot Wheels The original “sweet 16” from 1968 included a Chevy Camaro, a VW Bug, and a concept pickup called the Dodge Deora. 3. Lunch Boxes In the ’50s and ’60s, the lunch box you carried to school instantly branded you as a cool kid or a hopeless nerd. 4. Ukuleles These are the hottest instruments for aspiring players, mostly because they are relatively inexpensive to own, easy to play, and their sound just forces you to smile. 5. Atomic Clocks Whether you call them sunbursts, starbursts, or atomic daisies, these Mid-century Modern clocks are always timely. 6. Turquoise Jewelry Native American jewelry, made with turquoise nuggets and highly specialized silversmithing techniques, can give a ordinary ensemble authentic flair. 7. Hats You can dress up any outfit with the right hat; for women ’20s cloche hats are en vogue again, while men always look dapper in a fedora. 8. Fountain Pens Most casual writing these days happens on computers, so when you need write something in ink, make it a ceremony with a vintage fountain pen. 9. Glass Paperweights The Bohemians and Venetians were leaders in millefiori techniques, while Baccarat and Clichy made French glass artisans proud. 10. Mickey Mouse Watches Walt Disney’s cuddly rodent has been keeping time since 1933, his skinny arms point to the hours and minutes on countless wristwatches and pocket watches. 11. Art Pottery Rookwood excelled at Art Nouveau and Arts and Crafts vases, Red Wing remains the king of stoneware, and Clarice Cliff proves that even plates can be works of art. 12. Beaded Handbags Women keep their lives in the purses, so why not contain it in a gorgeous vintage handbag, particularly an intricately detailed beadwork bag. 13. Old Fur Coats While it’s controversial to wear a brand-new fur coat, some women dodge the guilt by donning a vintage fur. And if it’s vintage Christmas-styled coat, so much the better. 14. TV Lamps In the 1950s they were dime-store fodder, but today TV lamps add a rich retro glow to any room. 15. Poison Bottles Nothing says “I love you” like a vibrantly colored bottle once used to contain poison. 16. 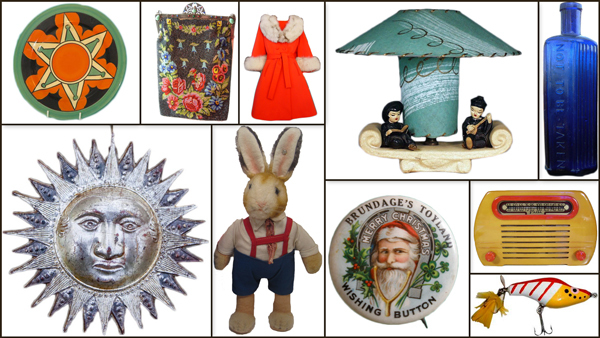 Christmas Ornaments Ditch the generic department-store ornaments and deck your tree with charming artifacts from Christmases past. 17. Steiff Stuffed Animals Lions, and tigers, and bears, oh yes!, but don’t forget the monkeys and bunny rabbits. 18. Pinbacks Celluloid pinbacks from the 1890s to mid-20th century were mostly used to advertise the campaigns of political candidates, but some seasonal pins promoted toy stores. 19. Radios Clad in plastics from Catalin to Bakelite, vintage radios were the iPods of their day. 20. Fishing Lures Companies such as Heddon, Shakespeare, South Bend, and Chubb Creek are famous for their spinners and spoons, sinkers and floaters, and minnows and frogs. 21. 45 RPM Records Elvis recorded for Sun, the Beatles made Capitol’s yellow-and-orange swirl famous, and Okeh 45s were always a-okay. 22. Fiesta This brightly colored dinner and table ware was first produced in 1936, which accounts for its Art Deco look. 23. Walking Sticks or Canes Carrying a cane gives a gentleman a touch of Victorian Era class—good ones have secret compartments for flasks or knives. 24. Hand Fans Ostensibly use to keep a lady cool, hand fans made of bone, lace, and even peacock feathers are actually tools for flirting the old-fashioned way. 25. Hobo Nickels Buffalo or Indian Head nickels were the most popular coins for hobo-nickel artists due to their thickness and low cost. 26. Patchwork Quilts They can be crazy, covered with checkerboards and stars, or appliquéd with countless floral motifs. 27. Vintage Video Games Atari kicked off the video-game craze with Pong in 1972, but Nintendo made it an art form with the 8-bit NES in 1986. 28. Hawaiian Aloha Shirts Looks for labels such as Shaheen, Catalina, Kamehameha, Kahala, Hale Hawaii, Royal Hawaiian, Duke of Hollywood, and—wait for it—J.C. Penney. 29. Bookends Books are more precious that ever, so keep them standing upright on a shelf between a pair of bronze or onyx bookends. 30. Thimbles Some were pounded from sterling silver and enameled, others were carved out of Wedgwood Jasperware, all prevented pin pricks. 31. Cowboy Boots These boots aren’t just for rustlers or country-and-western singers. In fact, everyone from New York fashionistas to Texan two-steppers favor this classic leather footwear. 32. Golf Balls Get your golfer a 19th-century gutta-percha ball, or find a two-tone model from this century. 33. Coffee Pots A vintage enameled, stainless-steel, or cast-iron kettle is great for tea drinkers and kitchen collectors alike. 34. Tin Robots This is what our future looked like to postwar Japanese toy makers. 35. Cookie Jars McCoy made its Cauliflower Mammy, Shawnee had its line of pigs, and American Bisque produced jars featuring cartoon characters from Popeye to Yogi Bear. 36. Dress Clips Similar to brooches, these costume jewelry pieces clip onto hats and dresses—Coro Duettes come in animal-couple pairs that can be wore together or separately. 37. Art Glass Choose a vase from Murano or, if you are feeling flush, spring for a Chihuly. 38. Tweed Blazers This sharp, conservative suit jacket, pioneered by Coco Chanel in the 1950s and worn by Jacqueline Kennedy, never goes out of style. 39. 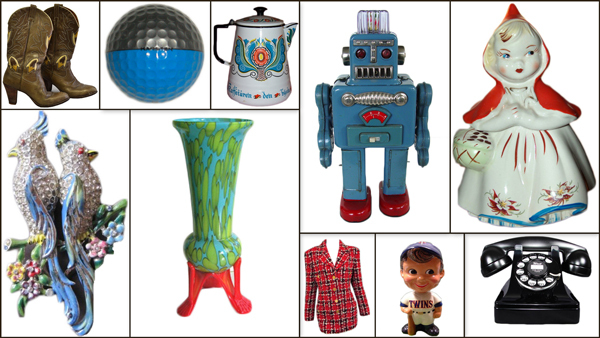 Sports Bobbleheads The Giants fan on your list will want Buster Posey, but team mascots from the 1960s and ’70s are always popular. 40. 302 Telephones Sometimes called the “I Love Lucy” phone, the Henry Dreyfuss-designed 302 was a Western Electric workhorse for two decades. What is this, how to buy a gift for your hipster?